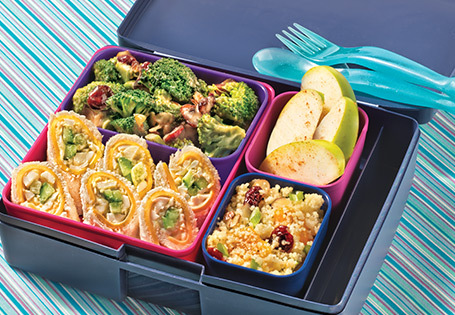 Egg salad wrapped up like a sushi roll with fruit, couscous salad & broccoli salad. Trim crusts from bread. Using a rolling pin, roll out slices to a 1/8-inch thickness. Top with a slice of cheese. In a small bowl, mix together eggs, mayonnaise, mustard, pepper and salt. Spread egg salad on top of cheese. Top with a cucumber stick and roll into a cylinder. Cut in half and wrap with plastic wrap. Prepare couscous according to package directions. Let cool. Toss with remaining couscous salad ingredients. In a medium bowl, combine all broccoli salad ingredients. Toss apples with lemon juice and cinnamon. Place in a sandwich bag and wrap tightly.